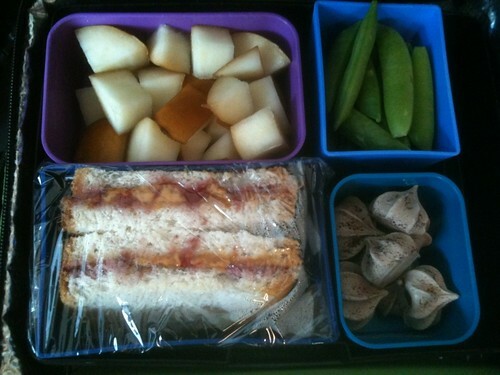 For all that this bento was made out of sheer desperation after failed dinner experiments left me without my usual bento fodder, it turned out… pretty well! Peanut butter and jelly sandwich. I’m not very good at making these, so the jelly leaked, but not disastrously. Chocolate meringue cookies. One of the few “normal” types of cookies I can eat, being made from, pretty much, just sugar without wheat, oats, or dairy.